Automatically incremental / differential backup mysql databases to backup files or to the other server. Automatic Backup Scheduler for MySQL > Tutorials > Automatically incremental / differential backup mysql databases. If you need to back up your MySQL database frequently, you may found it's really troublesome. If your MySQL database is very large, you have to waste a lots of time to back up it, and it may takes up a lots of disk space. We advise you make incremental / differential backup. For example: Make a full backup every week and a incremental or differential backup every day. Step 2: Enable the binary logs, and then launch the software and create a task to Back up MySQL databases to the SQL files. For MySQL incremental/differential backup, you need to enable the binary logs at first. Enter the name of the task on Step 1 of the Task Wizard and click Next. Connect the source server on Step 2 of the Task Wizard and click Next. 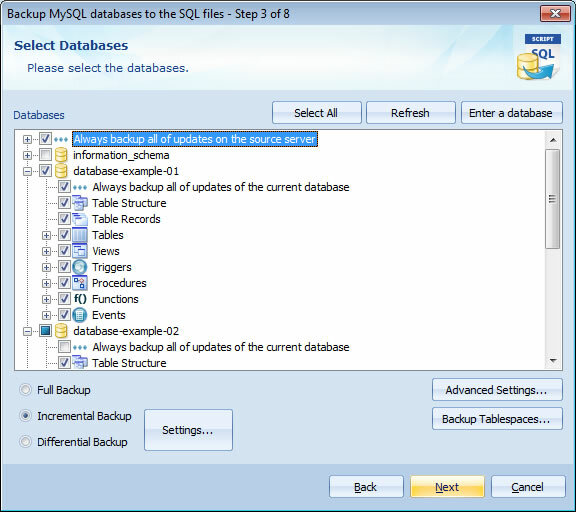 If you want to make an incremental backup to the other MySQL server, please create a Back up MySQL databases to the other server task. Step 3: Choose the option Incremental Bakcup or Differential Bakcup. Please select the database which you want to backup and choose the backup type and set up the advanced options on Step 3 of the Task Wizard and click Next. If you check the option Always back up all of updates of the current database and the software will automatically add the newly created items and remove the dropped items from the source database list of the task for backing up, you don't need to edit the task manually. And it's easily to choose if back up the Tablespaces or not. Choose the Option Full Bakcup and the software will back up all selected items every time. Choose the option Incremental Bakcup and the software will back up all updated records from the selected items since the last full, differential or incremental backup. Choose the option Differential Backup, and the software will back up all updated records from the selected items since the last full backup. Please click Settings... to set up the Incremental/Differential Backup Options. Don't make any full backups except first time: It only make a full backup at the first time. Make a full backup every some Incremental/Differential backups: The first time is a full backup and then the software will make a full backup every some times. Note: After changing the settings of Incremental/Differential Backup task by editting the task, the software will ask if you want to make a full backup again. Step 4: Click Next and follow the Task Wizard to finish the task creation. Please click Next to set up the backup files options and choose the Task Scheduler for running the task on Step 7 of Task Wizard to copy MySQL databases on schedule. If you want to restore the backup files to a MySQL database, you can use the Backup File History to quickly create a recovery task, the software will automatically add the related backup files of the incremental/differential backup to the file list. That's all. The software will automatically incremental/differential back up the MySQL database.